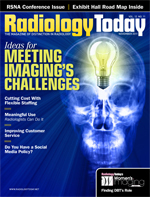 Many—if not most—approaches to improving imaging center productivity focus on getting physicians to read more images per clinic session. But administrators at University of Virginia (UVA) Imaging Associates have launched a systemwide effort to increase efficiency by improving administrative and clinical operations. David A. Dierolf, outpatient imaging affiliates vice president of performance improvement, and Michelle Troutman, RT(R), imaging administrator, described their strategy in a joint presentation, along with Susan Hawkins, RT(R), of Raleigh (N.C.) Radiology, at AHRA’s annual meeting held in Grapevine, Tex., in August. UVA Imaging Associates primarily serves patients of the UVA Health System in Charlottesville, Va. It operates five MR units, four CT units, five ultrasound units, five x-ray rooms, a bone density unit, and an interventional fluoro room focused on pain management procedures in two imaging centers. The practice employs 100 people and performs 80,000 to 85,000 procedures per year. Imaging practices large and small face the same challenges and threats caused by ever-rising costs and diminishing reimbursement rates. Since implementation of the Deficit Reduction Act in 2007, Dierolf recalls, government efforts to reduce healthcare expenditures seem to have focused efforts on lowering imaging reimbursement. Since imaging equipment translates to comparatively high fixed costs, increased productivity offers the best hope for maintaining or improving profitability. Any effort to improve efficiency begins with determining how to measure productivity in a meaningful way. Dierolf uses several methods, beginning with the “50,000-foot view,” comparing systemwide data with national and regional benchmarking data. While such data are useful to get an idea about where you stand compared with other practices, they don’t provide practical indicators about improving your productivity. “Better to push measures down to where the action is—to workgroups and operations personnel who make scheduling decisions, “ says Dierolf. Rather than looking at broad statistics such as “global revenue generated for every employee-cost dollar,” he finds it more useful to study ratios at the department or modality level. By measuring numbers of exams against staff hours worked, you can track efficiency (or lack thereof) in the arena where you have some control. When analyzing data (regardless of the level), don’t fixate on a few individual numbers; track trends instead. Is the ratio getting better or worse? A data line that tends to spike and dip radically from day to day will appear smoother if you step back and look at it a week or a month at a time. Averaging the numbers over a longer time horizon will help you better identify trends you can target for improvement. Still, the most precise data won’t do you much good until you figure out what is behind the numbers’ trending; only then can you figure out what to do to improve performance. When it comes to measuring efficiency and productivity, you’ll find the key measure by dividing output by input—in this case, dividing exams by the resources necessary to produce them. • Increasing throughput via process improvement, staff adjustments (such as increased tech aides), or downtime reduction (cancellations and no-shows). • Optimizing staffing to match exam volume. In January, Troutman faced one of the more-or-less typical administrative challenges that come with running a large imaging practice: Two full-time evening-shift employees left the MRI department at almost the same time. The two vacancies created an opportunity to adjust the department’s labor and better match recently declining patient volumes, so the practice decided to hire two half-time flex employees. Troutman found it difficult to recruit part-timers in the Charlottesville area until deciding to offer certain benefits, including paid time off and health coverage. Two new flex-hour workers agreed to hire on while the practice worked out details to modify its health plan for part-timer coverage. When the patient schedule called for more help, the flex employees would work longer hours. Recognizing that flex scheduling could work in other departments as well, Troutman worked with her team to develop a plan for studying productivity and eventually implementing demand-driven staffing throughout the practice. They determined early on that department supervisors were in the best position to influence the plan’s success. Therefore, they paid extra attention to planning how to recruit their support, train them, and provide effective tools to help them in their roles. • In April, it finalized arrangements to offer health plan benefits for part-time employees and acquired a new time-clock system that provided robust and easy reporting on hours worked during each shift in each department. • In May, the team developed the centerwide productivity goal for the coming fiscal year. As the team studied the preliminary data, it decided to pursue a relatively conservative goal: to improve productivity across the organization by 5% in the program’s first year. • In June, team members introduced the productivity plan to supervisory staff, educating them on the centerwide productivity goal. Administrators explained what would be expected of the supervisors and trained them on the tools and resources that would support them. UVA Imaging has a quarterly employee evaluation program, so the supervisors were already accustomed to greater accountability than in many practices. Still, the new plan made them uneasy. Anticipating this resistance, Troutman brought the supervisors on board with gradual steps. At first, she focused on securing their commitment to record and report on patient numbers and employee hours. Some of the managers inferred increased accountability into the reporting requirement and felt threatened. They needed regular reassurance throughout the data-gathering phase of the project. When July rolled around, the training and integration program continued for the supervisors. The practice conducted training off site, away from the daily routine and interruptions, to teach them how to query the practice management system for patient scheduling and activity. They learned how to use the daily forecasting and productivity tools. As the fiscal year opened in July, another full-time employee unexpectedly tendered her resignation. The management filled the vacancy with two more flex-time employees, providing another opportunity to expand the program. With supervisor training complete, the stage was set to get down to business in August. In August the supervisors started using the new tools to analyze and forecast productivity in each work area. Even in this early stage, some of the supervisors continued to express concern about the data-gathering process. They anticipated being criticized for having too many staff and feared possibly being required to run their departments under Spartan conditions in the future. For the remainder of the first quarter, UVA Imaging management focused on staffing levels. During the second quarter, the management team has begun widening its efforts to study other factors that affect efficiency. They will analyze hours of operation at each department to see whether the current schedule has excess capacity. “Normal business hours” doesn’t make sense if the departmental schedule isn’t full. They intend to look at other administrative and workflow processes as well. Even small details won’t escape scrutiny. For example, Troutman says they’ve already begun studying the fluoro suite to see whether the layout could be changed for better flow. While UVA Imaging set a conservative goal (5% improvement in the first fiscal year), Troutman suspects they will achieve greater efficiency than that. Practices categorize all operating expenses in two major groups: fixed and variable. Fixed expenses include facility costs (eg, rent, taxes, and insurance), imaging equipment acquisition and maintenance, malpractice insurance, staff salaries and benefits, and many others that remain generally the same from month to month regardless of patient volume. Because medical practices make commitments to full-time staff, employee-related costs are somewhat fixed. From day to day, practices pay the workers to do their jobs, whether or not a single exam is scheduled. If the practice grows, opens new facilities, or adds new modalities, management usually has to increase staff. If downsizing the practice, employees will be laid off. So patient volume impacts staffing levels but unfolds over a longer time frame. In the long run, all expenses are more or less variable. Staff-related costs occupy one of the top expense categories in most businesses, including medical practices. Personnel costs usually run at about 45% of total operating costs in diagnostic imaging practices, according to the “Cost Survey for Single-Specialty Practices — 2010 Report Based on 2009 Data” published by the Medical Group Management Association. If a practice can connect labor expenses more directly with patient volume, it should see measurable improvement in overhead ratios. That’s why it makes sense to take a serious look at flexible staffing, creating a workforce that can grow or shrink to meet patient demand. Some practices have already experienced productivity gains this way. Raleigh Radiology, a multisite, multimodality center in North Carolina, has been able to reduce labor costs through a combination of full-time, part-time (including job-sharing), and PRN staffing. Hawkins, Raleigh Radiology’s administrator, says the practice has even reevaluated its concept of full-time employment, exploring the possibility of hiring staff at 32 hours per week, with the potential for flexing up to 40 hours when needed. It has developed a pool of PRN staffers trained across all modalities for quick, temporary assignments. Larger organizations—those with multiple centers and modalities—have a clear advantage when it comes to implementing flexible scheduling because each employee represents a smaller percentage of the overall staff than in a smaller organization. Adjusting one worker’s hours has a smaller impact on the overall operation. • Employee expectations: Communicate your expectations regarding availability and cooperation. What are each position’s minimum scheduling requirements? • Communication vulnerabilities: Part-timers can easily miss vital communications, so use phone and Web-based communications to include everyone in the loop. Further, managing a flexible program effectively requires staff feedback as well. • Training needs: Traditionally, employers invest less training in part-timers. Make a substantial commitment to training and follow through across the entire organization. • Appropriate PRN levels: Monitor closely—overstaffing is costly, and understaffing can destroy customer service and morale. Manufacturers who implement “just-in-time” supplies to save on inventory costs have paid dearly for miscalculations, especially when they’ve had to shut down an operation while awaiting raw materials. Improving productivity requires a mindset prepared for the long haul. Efficiency isn’t so much a goal as it is a process. Flexible scheduling requires diligent oversight, as you must monitor performance constantly and make adjustments as needed. Training never ends, and keeping physicians and staff engaged requires continuous, clear communication. It takes time to develop a core of flexible workers, and some workers aren’t cut out for such variations in schedule. But properly executed, a systemwide strategy like this can bring even more benefits: It can change the culture of your organization. Keeping score always changes the way people “play the game.” They become sensitive to issues such as efficiency, cost control, and teamwork. Satisfying patients and referrers can take on a higher priority, and workers at every level should feel more engaged. — Timothy W. Boden, CMPE, has spent 22 years in practice management as an administrator, consultant, journalist, and speaker. He is a frequent contributor to Radiology Today. He can be contacted via e-mail at tboden@aol.com. • Referring physician satisfaction: Referrers have definite expectations regarding appointment availability, scheduling convenience, and report turnaround times. Understaffing or closing the office at the wrong time can disappoint referrers and dry up patient sources. • Practice growth: Staffing levels are about capacity. Allowing for growth requires an overhead margin to accommodate greater volumes. Staffing only for “today” carries some risk of not being properly prepared for tomorrow in a growing practice.